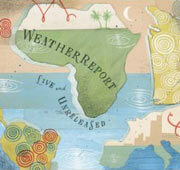 Details continue to emerge regarding the upcoming Sony release, Weather Report Live & Unreleased. The tracks come from seven concerts, spanning the years 1975-1983. The 1975 recordings with Alphonso Johnson, Chester Thompson and Alex Acuna are particularly noteworthy because there are no official live recordings of this version of the band. The North Sea Jazz Festival organizers announced that Joe Zawinul is the winner of this year’s “Special Appreciation” Bird Award. The Zawinul Syndicate performed at the festival last night. Incidentally, Zawinul’s Weather Report cofounder Wayne Shorter was the recipient of the festival’s other major award, the Edison Jazz Oeuvre Award. 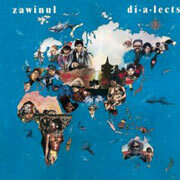 ESC Records sends word that Zawinul’s new album, Faces And Places, will be released on September 2 in “G/A/S” (is that Germany, Austria and…? ), and September 16 in the rest of Europe. No word on the United States release. Meanwhile, ESC has added a lot of new information about the album on their web site, including audio clips, musician and track listings, and liner notes by Bill Milkowski. An early birthday party—Zawinul turns 70 on July 7—was held on June 30 at Jazzfest Wien in Joe’s hometown of Vienna, Austria. Pictures and video clips can be found at the Jazzfest Wien web site. (The direct link to the pictures and video clips is here.) According to my friend Thomas Kober, who said a television broadcast of the concert, the women on stage with the Syndicate are Sabine Kabongo and Mavana (Lucile, Eliane, Annie Andriamanana and Monique Raoiliarimalala). Meanwhile, Zawinul’s record label, ESC Records, promises that this month’s news on their web site will be dedicated to Zawinul. So far two updates in four days, so check it out. The Lugano Estival Jazz festival will be broadcasting performances live on the web, including the Zawinul Syndicate performance on July 6. For more information, visit the festival web site.